Store > Meditation Accessories > Folding Meditation Bench. In multiple colors. This padded meditation bench with folding legs helps you sit up straight and stay relaxed and comfortable for longer meditations. It is handmade from the finest hardwood, padded with cotton batting, a layer of foam, and covered with cotton silk fabric. Eight inches tall (from back/ high side). 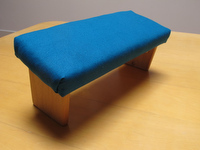 Pariyatti stocks these benches with a teal-colored cover. We have them for sale in our store in Onalaska, WA, USA, but we no longer ship them. They may be ordered for shipping directly from the manufacturer, Ananda Woodworking, in California, where they are available in multiple colors. It is comfortable; better than I expected. It folds so it's convenient to carry and to use in different positions. Overall quality is very good, height is just perfect for me (I am 5'9"). It is very helpful during meditation to keep my back and head straight. Mobile Meditator Crescent Moon Inflatable Cushion. In multiple colors.